Invoices are only available to current SiriusDecisions clients. If your email address is not found within our client list, you will not have the option to pay by invoice at the end of your registration. Discount codes can apply to all payment methods. Fill out the information below, then click Next to proceed. We are only able to process registrations with a valid business email address. Domains such as @gmail.com, @hotmail.com and @yahoo.com are not supported by this system. If you have any questions, please contact SDEvents@SiriusDecisions.com. 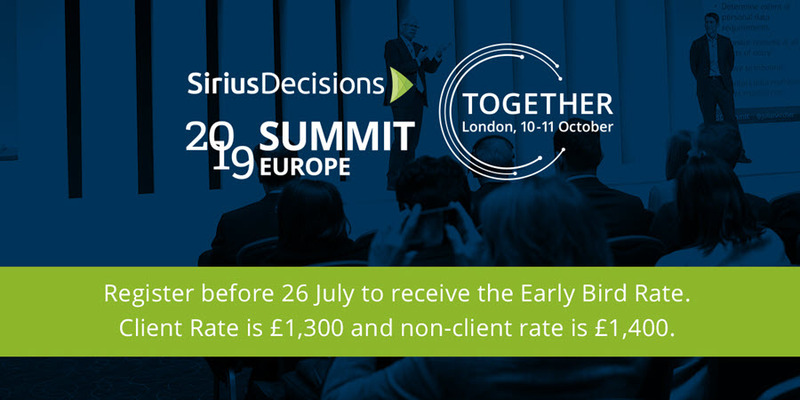 Please note that SiriusDecisions Summit is an end-user conference and SiriusDecisions reserves the right to approve all delegates. Need to transfer a ticket to a colleague or make an update to your existing registration? Follow these instructions.